This could very well be the Cardinals breakthrough season. Middleton welcomes back senior outside hitter Eagan Peters-Michaud, a first-team all-conference selection last year, and second-team all-Big Eight middle blocker Sam Dettman. In addition, the Cardinals bring back a handful of contributors from last year and welcome several gifted newcomers. The combination of veterans and incoming talent has White buzzing. Middleton will build around Peters-Michaud and Dettman. Peters-Michaud will be a third-year starter on the outside. Last season, Peters-Michaud led the Cardinals with 287 kills and added 25 aces, 23 blocks and 165 digs. Dettman became a force in the middle last year and finished with 187 kills, 18 aces and 33 blocks. Senior Dylan Griffith takes over the libero position. Griffith was buried behind all-state player Thomas Robson in recent years, but still had 24 aces and 227 digs. “Just a solid player,” White said of Griffith. “He will provide our defense with a great foundation. He will step into a leadership role on the team as well. Senior Owen Engling, who stands 6-feet-6, will most likely be the Cardinals’ big on the right side. Junior Parker Van Buren, who is also 6-foot-6, will be Middleton’s other outside hitter. Senior Matt Ballweg takes over the setter position that Andrew Lepage excelled at in recent seasons. Ballweg, coming off a highly successful baseball season, seems poised for a big year. “We want him to take the job and run with it,” White said of Ballweg. “We want him to not worry about filling Andrew Lepage's shoes, but just do what we know he can. 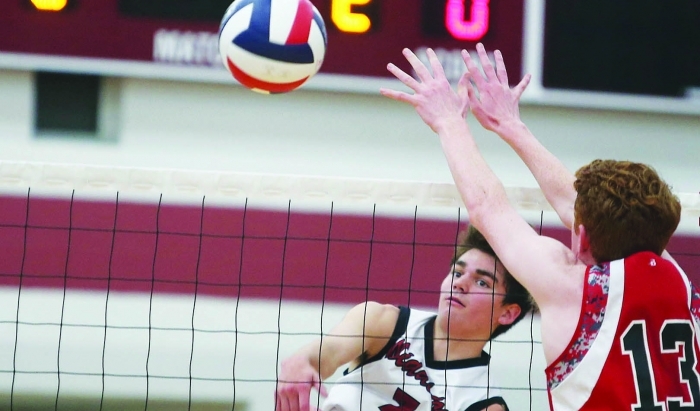 Junior Max McDonough is in the hunt to become Middleton’s second middle blocker. Junior Matthew Stormer figures to be the Cardinals’ defensive specialist and will play in the back row for the Cardinals’ rightside hitter. Junior Scott Buros is an extremely powerful player who’s competing for time as an outside hitter. One reason for the Cardinals’ success is a bond that’s created throughout the program. At the start of every practice, varsity players are paired with younger players to work on fundamentals and get to know each other. “This way each young player is getting 1-on-1 instruction from a mentor,” White said. White also meets with his entire coaching staff on a daily basis to talk about the lower level teams. “I always know what is going on at the JV and freshmen levels,” White said. White undoubtedly knows his close-knit program inside and out. He fully understands the Cardinals have outstanding talent once again. Now, the great mystery he wants to solve is winning matches at state. “You have to have a little bit of luck, along with a whole lot of skill and mental determination,” White said. Maybe, just maybe, this is the year.